Does a consistent routine work with children? Introducing vegetables and fruits early on instead of later is obviously healthy and you’ll PROBABLY have fewer arguments. Vegetables like broccoli and spinach are hard to introduce to a child when they’re around four or five so it’s best to do it once a child can safely start eating solids. My two and a half-year old loves broccoli and she actually proclaims it out loud, which is very funny during dinnertime. She may have days where she doesn’t want to eat it so I give her something else like tomatoes. You have to mix things up and please don’t give up. I know firsthand that it’s hard and I will admit that I have thrown in the towel several times. Fortunately for me, I have a backup plan and that’s my husband who takes over when I need a break. It’s true when they say, “just because they don’t like it one day, doesn’t mean they won’t like it another day.” I send my daughter to school with a small container of veggies and a small container of fruits in her lunch bag along with her main dish. It is my responsibility to send her to school with a healthy lunch. I also include a small snack that she enjoys and as for her drink, we alternate days between water and juice. I don’t want to be too strict or even a hypocrite because my coffee in the morning can definitely use a little less sugar. I try my best to balance things out and that’s why I made a choice awhile back to banish soda from my home. So far, so good. As for good manners, if you make it a habit in saying “please” and “thank you” along with “you’re welcome” and “I’m sorry,” your children will pick up on these words and start repeating them, non-stop. It’s wonderful to hear my youngest say, “good morning,” to me and “excuse me,” when someone is in her way. I loved it when my daughter’s teacher told me that she had exceptional manners during our parent/teacher conference last year. Can you imagine living in a world where everyone practiced good manners? As corny as it may sound, it would be a nice world to live in. We just have to do our part and pass the lessons on to our children. If you haven’t started a routine or a schedule, start now. It might be hard and take a while, but your child will benefit from knowing what they’re supposed to do and why. They need and will welcome structure in their lives. I’ve said it before and I’ll say it again, it’s our job to teach our children first. They look up to us. We are their first teachers. Expectant mothers, new moms, guardians, etc. hear and believe me when I say that once your child is tucked in at a consistent time every single night, your time to relax begins every single night as well. So start putting into practice those routines and stay consistent. You’ll never regret it. Hello everybody! I hope you guys are well and safe. Happy Halloween! Unfortunately, there are many people still dealing with the aftermath of Hurricane Sandy and we hope they are safe and able to recover. This past Sunday, the 28th, we had an early Halloween party for the kids and my husband’s judo pals. It was a small gathering and we had a lot of fun. …Merida, from Disney’s Brave movie. We bought the costume and bow and arrow set from Target. That’s a wig on her head that she left on for the picture. 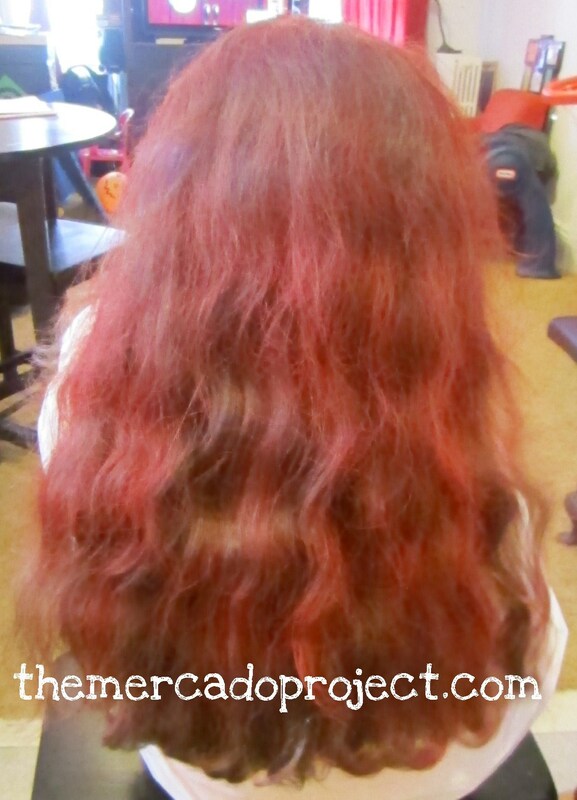 She took it off immediately because she didn’t like having it on, but before that we tried to change her hair with color hair spray so it could resemble Merida’s red hair. This was the result and she liked it, but couldn’t stand the smell of the spray. In fact, she wouldn’t stop complaining about it so I washed her hair and the spray came off easily. If you’d like to know, we used a brand called bright color Hair Spray and we got it at Target. Olivia as Merida with her natural, beautiful brown hair! 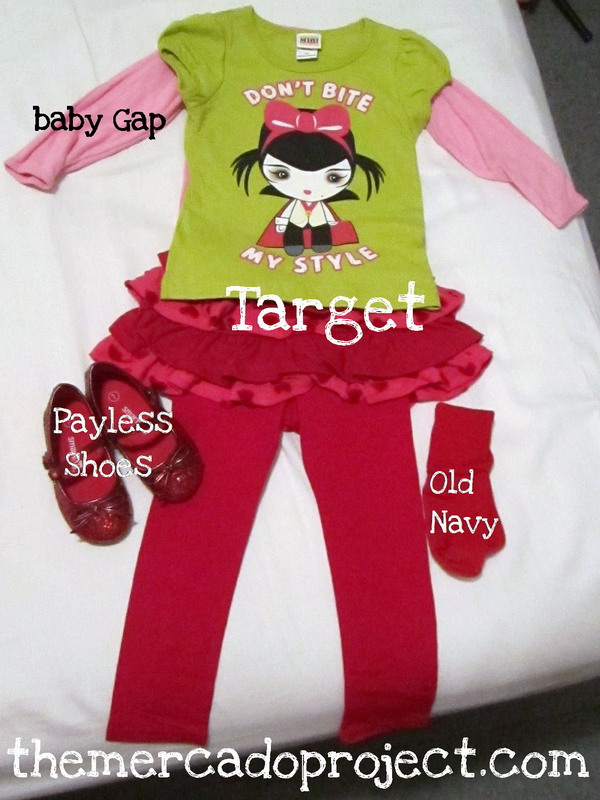 As for my youngest, she simply didn’t want a costume so I put together a cute little outfit. I bought the short sleeve t-shirt (Gwen Stefani’s Harajuku for Target) and combo skirt/leggings from Target. I already had the pink long sleeve onesie, the red socks, and red glittery shoes. I crossed my fingers and put the outfit on. She didn’t fight the outfit, but I had to stalk her around the apartment in order to get a picture of her dressed up. Got her in the kitchen! 🙂 My Harajuku Vampire diva! 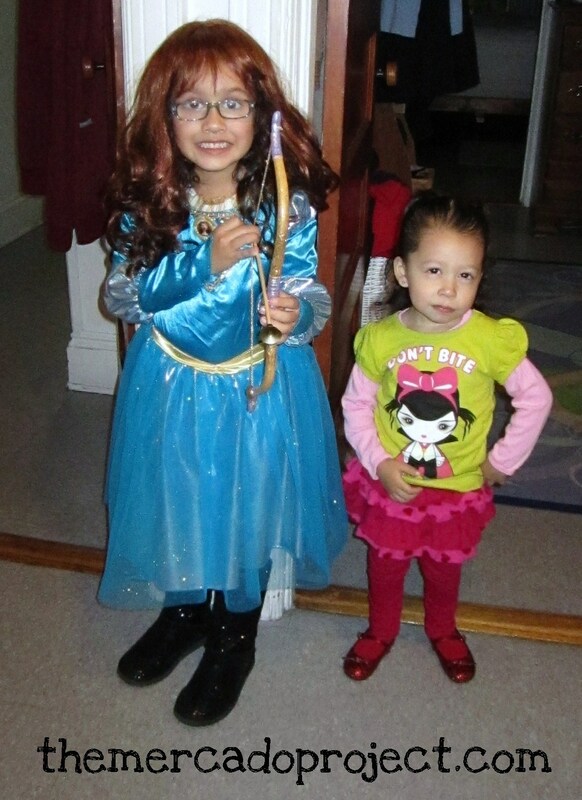 My sweet, little girls, dressed up for Halloween 2012. Look at the diva’s face, HILARIOUS!! 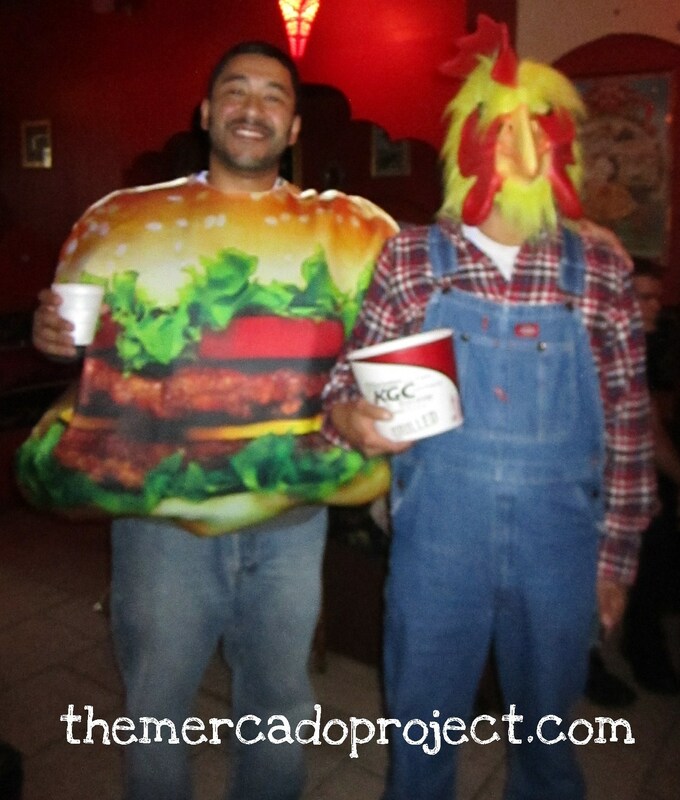 My husband, Angel, went as a HAMBURGER and his friend, Tyson, was a chicken. As for myself, I was indeed the party pooper. 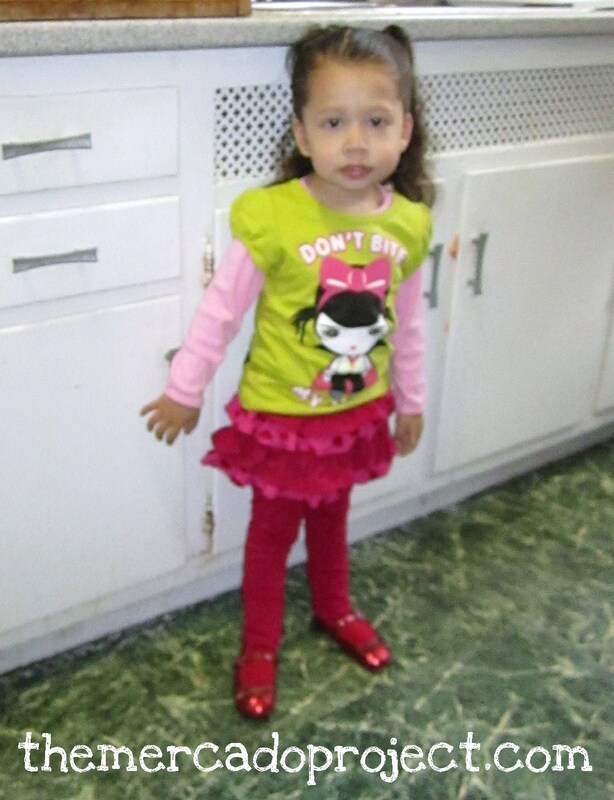 I wore a regular outfit, shirt, skirt, leggings, black booties, and a headband with a little witch’s hat on it. 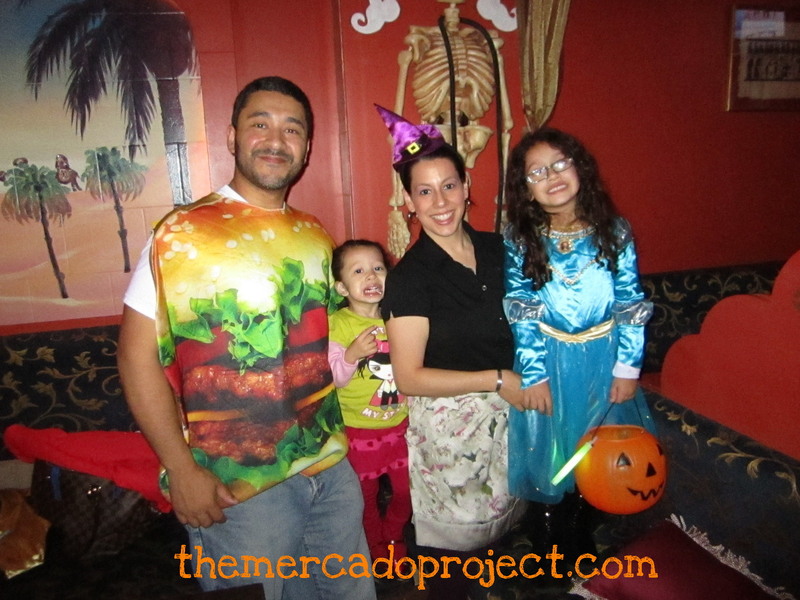 HAPPY HALLOWEEN 2012 FROM THE MERCADO FAMILY!